Deborah Harkness is a professor of history at the University of Southern California. She has received Fullbright, Guggenheim, and National Humanities Center fellowships, and her most recent scholarly work is The Jewel House: Elizabethan London and the Scientific Revolution. She also writes an award-winning wine blog. 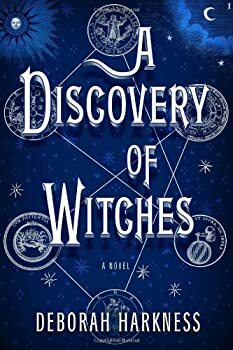 Read excerpts of A Discovery of Witches at Deborah Harkness’s website. CLICK HERE FOR MORE TITLES BY DEBORAH HARKNESS. All Souls — (2011-2014) Publisher: A richly inventive novel about a centuries-old vampire, a spellbound witch, and the mysterious manuscript that draws them together. Deep in the stacks of Oxford’s Bodleian Library, young scholar Diana Bishop unwittingly calls up a bewitched alchemical manuscript in the course of her research. Descended from an old and distinguished line of witches, Diana wants nothing to do with sorcery; so after a furtive glance and a few notes, she banishes the book to the stacks. But her discovery sets a fantastical underworld stirring, and a horde of daemons, witches, and vampires soon descends upon the library. Diana has stumbled upon a coveted treasure lost for centuries — and she is the only creature who can break its spell. Debut novelist Deborah Harkness has crafted a mesmerizing and addictive read, equal parts history and magic, romance and suspense. Diana is a bold heroine who meets her equal in vampire geneticist Matthew Clairmont, and gradually warms up to him as their alliancedeepens into an intimacy that violates age-old taboos. This smart, sophisticatedstory harks back to the novels of Anne Rice, but it is as contemporary and sensual as the Twilight series — with an extra serving of historical realism.